This year, make a perfectly seasoned Thanksgiving turkey with just four ingredients (including the bird)! It’s so easy with Garlic Gold®. We sprinkle our Sea Salt and Herbs de Provence Nuggets generously, then drizzle with Garlic Gold® Oil. After a few hours in the oven, it’s golden brown, perfectly cooked, and absolutely delicious. The pan drippings make amazing gravy, too, since they’re full of roasted garlic flavor. Rinse the turkey and remove the neck and giblets, then use paper towels to fully dry the turkey, inside and out. Use the blunt handle of a spatula or cooking spoon to separate the skin of the turkey from the meat, taking care not to puncture the skin. Start by loosening the skin from the turkey breasts, then continue to poke the handle around the thighs, legs, and back of the turkey until all of the skin is loose. Place the turkey on a rack in a large, high-sided oval or rectangular roasting pan. The pan should be big enough to give the bird at least an inch of space on the sides. 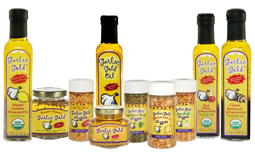 Liberally sprinkle the whole turkey, inside and out with the two shakers of Garlic Gold® Nuggets, taking care to lift up the skin and sprinkle nuggets between the skin and the meat. Use your hands to massage the spices into the bird. 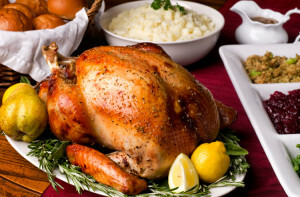 Drizzle the Garlic Gold® Oil on the inside and outside of the turkey, coating it thoroughly. Insert a probe thermometer into the thickest, inner part of one of the turkey’s thighs, making sure the tip of the probe isn’t touching bone. Place the turkey in the oven, threading the thermometer probe’s wire out the oven door. Set the thermometer for 150ºF. When the thermometer alarm goes off, remove the turkey from the oven and baste, placing the roasting pan cover or a tent of foil over the bird if it’s larger than 14 pounds. Return the turkey to the oven and let cook until the thigh registers at 165ºF. Let the bird cool for 30 to 45 minutes, then carve and serve, storing any leftovers in the fridge within two hours. Leftover turkey can be kept for three to four days in the refrigerator, or frozen for up to 3 months. If you’re going to be cooking the holiday meal, plan to buy your turkey well in advance to ensure that it’s fully thawed come the day of the feast. Smaller (10 to 14 pound) birds take at least three days to thaw in the fridge, and bigger turkeys can take up to a week! Snag yours this weekend, to avoid any last minute hiccups. This way, you can just stick the thermometer in the turkey’s thigh, then set an alarm and attend to other kitchen tasks while it roasts to a beautiful golden brown. If you only have an instant-read thermometer (the kind that can’t hang out in the oven while the turkey cooks), remove the turkey from the oven after an hour and a half and check its temperature, then continue to check every 15 minutes or so until the thickest part of the thigh measures 165ºF. Once you’ve removed the turkey from the roasting pan, add a splash of stock or broth and use a wooden spoon to stir up all the drippings from the bottom of the roasting pan. Transfer the drippings to a medium (2-quart) saucepan over medium heat, whisking in two tablespoons of flour. Add a quart of stock, bring up to a simmer, and stir until thickened.